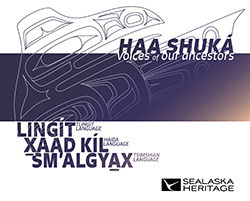 Sealaska Heritage Institute (SHI) has chosen five language teams to participate in its Haa Shuká Community Language Learning Project, a new program designed to help revitalize the languages of the Tlingit, Haida and Tsimshian in four Southeast Alaska communities. Five mentor-apprentice teams were chosen in Juneau, Sitka, Metlakatla and Hydaburg: In Juneau, Tlingit (Lingít) speaker Florence Sheakley (Kaakal.aat) will mentor Mary Folletti (Daaljíni) and Michelle Martin (Keiyákwch Yawu.á), and Paul Marks (Kinkaduneek) will mentor Kyle Demientieff Worl (Kaayák’w) and Michael Hoyt (Aak'wtaatseen & Gashax). In Sitka, Tlingit (Lingít) speaker Ethel Makinen Daasdiyáa will mentor Kassandra Eubank-Littlefield (Laakdu.oo) and Lakrisha Brady (Chookan). In Metlakatla, Tsimshian (Sm’algyax) speaker Sarah Booth (Goodm 'Nluułgm Xsgiik) will mentor David Robert Boxley (Gyibaawm Laxha) and Kandi McGilton (Mangyepsa Gyipaayg). In Hydaburg, Haida (Xaad Kíl) speaker Cherilyn Holter (T'aaw Kuns) will mentor Andrea Peele (Sgaan Jaat) and Bonnie Morris. The teams will meet weekly to immerse themselves in their respective languages over three years. Language learners will also enroll in language courses through the University of Alaska Southeast and work independently on transcriptions of language recordings and documents to build their fluency. Sm’algyax apprentice David R. Boxley joined the program to become fluent in the language of his ancestors and to see the world from their point of view. Xaad Kíl apprentice Andrea Peele said that for most of her adult life she has been involved with a Haida dance group, but she has felt a disconnect. As part of the project, SHI established a Southeast Regional Language Committee to provide guidance for the language teams and to help integrate the project with existing initiatives across the region. The committee is made up of heritage language speakers and advocates Lance Twitchell (Lingít), Ben Young (Xaad Kíl), and Gavin Hudson (Sm’algyax). To encourage broad involvement, SHI will also work with the committee and regional groups to organize monthly language events and biannual immersion retreats in each partner community that will be open to the public. Project partners include the Sitka Tribe of Alaska, the Haayk Foundation, and Hydaburg City School District. Statement: I believe language is a means of connecting, relating, and understanding the world around us, whether it’s our communities, lands, culture, and history. I think language will also be a vital part of our future, especially in how it helps us continue to make these connections, which means language education is vital. As a teacher and cultural specialist with the Juneau School District, I want to make the next step in my own language abilities so I can be a better teacher, and Haa Shuká will help with that goal. Bio: Cherilyn was honored to work with Claude Morrison, Anna Peele, Woodrow Morrison Sr., Charles Natkong Sr., Viola Burgess, and Alma Cook. Cherilyn is currently teaching at Hydaburg City School K-12. Cherilyn believes it is her responsibility to learn all she can about her culture and to share all she has learned.